Ever had the urge to swim with giant, friendly sharks? Well, you can do that in Donsol, in the central Philippines. 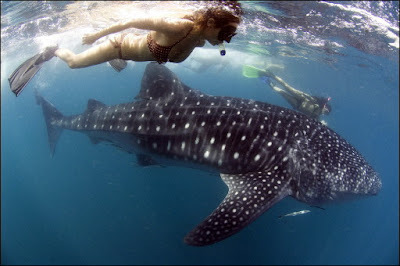 The whale shark, which is called butanding by the Donsol natives, used to be hunted down for their meat. But since this activity was outlawed, the fishing community has now turned into a major eco-tourism destination where visitors from all over the world can commune with these gentle giants of the deep as they feed on plankton. Whale sharks are the largest fish in the world.